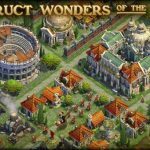 Previously, we brought you some tips and tricks for DomiNations, NEXON M’s iOS and Android mobile game designed by the well-known Brian Reynolds, who had previously worked on Civilization II and Rise of Nations. This game, like Reynolds’ aforementioned body of work, allows you to build a civilization rather than a city, and in here you can choose from one out of seven different nations. 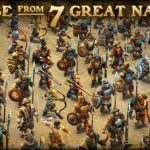 And since you’re already well-aware of some of the things you can do to dominate in this game, we’re now going to bring you some DomiNations tips for choosing the right nation. Yes, it can be a tough decision, but we’re here to make it easier for you. Speaking in general, none of the nations in DomiNations has a truly distinct advantage in the grand scheme of things. Still, your choice of nation will depend on the strategies you want to employ and the benefits you want to gain, which is what brings us to the following tips below. Choosing the British gives you more loot from enemies, and this is the nation you want if you like an aggressive attacking offense that can penetrate defenses. Conversely, the Brits have a weak defense as there are no defensive bonuses if you go with them. Their special unit is the Longbowman, which has a wider attack range than other units. Your special power here is getting an extra citizen and defenders, while you can get an attack rate boost through the special Chu Ko Nu unit. Overall, the Chinese are quite balanced and recommended for those who want a “jack of all trades” type of nation, but that’s also this nation’s weakness, as the Chinese also don’t have a distinct advantage in any one category. Want to train your army quickly? Go with the French, who have the Chevalier (high health, tank-like capabilities) as their unique unit. As the Chevalier has a lot of health points, this could come in really handy during long battles. Then again, the French don’t have any defensive/economic bonuses to speak of in DomiNations. Go with the Germans if you’re someone who likes elaborate strategies, as the Quicker Rally power reduces the rally timer in battle. Rally Speed can also be unlocked here, as this has your troops moving faster than they normally would. The nation’s unique unit is the Vandal, which deals out more damage per hit. Like the French, however, the Germans don’t have economic or defensive bonuses, and Rally isn’t exactly a game-changing option in this game. Choosing the Greeks allows you to build your base faster without having to use as much resources, due to their architectural power. And the Companion, despite its uninspiring name, is arguably second-best behind the Chevalier in terms of unique units; it deals a bit more damage and has a bit more health than the average troop. The Greeks are weak on defense (no bonuses) and since you’ll probably end up with more surplus resources, that’ll leave you vulnerable to more attacks. Many believe the Japanese are the best nation in this game, due to their all-around strengths and their Mighty Defenses power (longer peace treaties). But if you want to build your civilization quickly with the Japanese, you need to always be on the attack, and attacking nullifies peace treaties. Last, but not the least, let’s talk about the Romans. Their strength is troop recruitment through the Massive Armies power, while their Legion troops have more health than average; that gives you distinct strength when attacking, specifically strength in numbers. Still, there are no defensive or economic bonuses, and since you’ll likely have the largest army, you’ll also need more resources to sustain them.